Wow! An absolute head turner and a stunner! 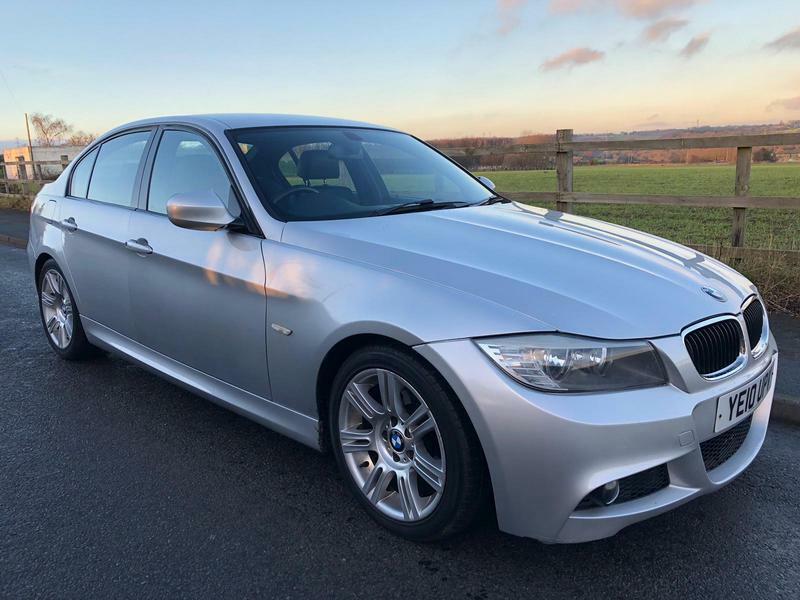 The sought after BMW 3 Series 2.0 318d M Sport 4 doors saloon with a 6 speed manual gearbox is available at Rylstone Motors Ltd. Drives and looks superb. It has loads of history with invoices and service book. HPI clear., Finance available. AU Warranty included if on screen price paid, terms and conditions apply. Also comes with free 12 months AA breakdown cover, terms and conditions apply. All major debit/credit cards accepted. Part Exchange welcome. Test drive welcome. We are open 7 days a week. Please call us on 07474 228082 or 07838 141786. Nationwide delivery available, please contact us for further information. You can even email us at rylstonemotors@outlook.com or why not visit our website, www.rylstonemotors.co.uk, Next MOT due 25/09/2019, Full service history, Clean bodywork, Black Full leather interior - Excellent Condition, Tyre condition Good, 17in Light Alloy M Double - Spoke with Mixed Run - Flat Tyres, Air Conditioning, Automatic with Two - Zone Control, Alarm System (Thatcham 1), BMW Professional Radio with Single CD Player (with MP3 Playback Capability), Cruise Control, Electric Windows - Front and Rear, with Open/Close Fingertip Control, On - Board Computer (OBC), Park Distance Control (PDC), Rear, Tyre Puncture Warning System (TPWS), Upholstery - Blue Shadow Cloth/Alcantara, Armrest - Front with Storage Compartment, Body Colour Bumpers, Anti - Lock Braking System (ABS), Central Door Locking - Remote Control, Centre Rear Seat Belt, Child Seat ISOFIX Attachment, Front and Rear, Child locks & Isofix system, Cup Holders, Front, Dynamic Stability Control (DSC) Comprising Automatic Stability Control (ASC), Cornering Brake Control (CBC), Dynamic Brake Control (DBC), Dynamic Traction Control (DTC), Electric door mirrors, Electric windows, Engine Immobiliser, Extended Lighting, Exterior Trim High Gloss Shadowline, Folding rear seats, Front Foglights, Front Anti - Whiplash Head Restraints and Rear Head Restraints, Headlining Anthracite, High Level Third Brake Light, Immobiliser, Interior Trim, Aluminium Glacier Silver, Leather Steering Wheel, Leather seats, M Sport Steering Wheel, Multi - Function Steering Wheel, M Sport Suspension, Outside Temperature Display, Parking aid, Rear - View Mirror, Automatically Dimming, Remote central locking, Windscreen Washer Jets, Heated, Steering Column with Manual Reach and Rake Adjustment, Exterior Mirrors - Heated, Electrically Adjustable, Seat Belts - Front, Inertia Reel with Pyrotechnical Belt Latch Tensioner and Belt Force Limiter. 5 seats, Silver, 3 owners, £5,190 p/x welcome!